As a novice (or recent new) golfer you may be overwhelmed by the number and variety of golf tips you come across. That is why we have grouped and organized a number of key concepts that will help you get some insight in the game and get you started on the golf course. Play of the Game and the basic set of equipment for the beginning golfer. Otherwise just read on. The first and most important golf tip you need to know is that playing golf is not just about having a good technique. Most novice golfers will put all their efforts into improving their game (technique), while there are in fact five axes along which you can work to become a better golfer. Technique is just the first one, but you can also work on your strategy (course management, scoring) and mental game (confidence) to make the most out of your current game, whichever your level at any given point. It is especially important to remember this any time you will reach a plateau in your technical game. Understanding the physics of golf (dynamics) and training your flexibility are also essential to support your technical game. You will find more info about these five key points throughout our website, but you may also want to consult the following books about the Physics of golf, Exercise guides for golfers and books that will teach you how to master the Mental game of golf. Gathering and understanding this background info will help you to feel more comfortable and confident before heading to the green and hitting your next (first) golf ball. Maybe this is not as straightforward to see, but knowing the golf rules and golf etiquette almost by heart is a first and relatively easy way to build up your confidence. The quintessence of this game is to show consideration for your fellow players, for the golf course and the golf rules, so new players who have a thorough knowledge of the theoretical game will force respect from their fellow players. So, we recommend you go through the golf rules and golf etiquette pages (for beginners, see: golf etiquette for beginners), and of course, grasp the general idea of the play of the game. Please also have a look at the safety tips on the golf course. Remember that sportmanship and etiquette form integral parts of the golf game, so reading these sections are really fundamental to understand what golf is all about. Then, of course, you have to choose the right equipment. Choosing the right equipment, tailored to your level, may considerably help you in ‘masking’ your temporary shortcomings in the game. To help you make the right choice, we advice you to first have a quick look at the pages explaining the basics of golf clubs, the different types of clubs, the golf ball faqs and types of shots used in golf. 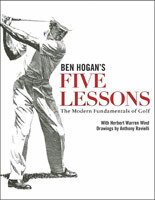 Make sure you also read this article explaining the basic set of equipment for the novice golfer. More advanced golfers may want to read the following article: Choosing the right equipment. Later on, you may also want to investigate a bit further about the different scoring systems and how handicap systems are calculated. However, if you are just starting, you may want to leave these topics for later. Once you will have gained some confidence and pratice remember to check our tips to further improve your game and lower your score. Every game of golf is based on playing a number of holes in a given order. 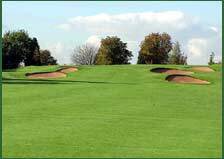 A round typically consists of 18 holes that are played in the order determined by the course layout. On a nine-hole course, a standard round consists of two successive nine-hole rounds. The hole on the green has a flag on a pole positioned in it so that it may be seen from some distance (but not necessarily from the tee). It is also termed “the pin”. Players usually walk (or sometimes drive) over the course in groups of two, three, or four, sometimes accompanied by caddies who carry and manage the players’ equipment and give them advice. Each player plays a ball from the tee to the hole. except that in foursomes (see our seperate article about the Types of competition, one player from each team tees off and the players then take alternate shots until the ball is holed out. For the shortest holes a good player requires only one stroke to hit the ball to the green. The grass of the putting green is cut very short so that a ball can roll over distances of several meters. “To putt” means to play a stroke on the green where the ball does not leave the ground. 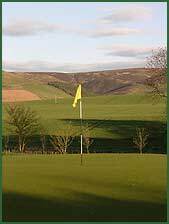 On longer holes the green is too far away to reach with the first stroke, so that one or more strokes are played from the fairway (where the grass is cut so low that most balls can be easily played) or from the rough (uncut grass or ground not prepared at all). The direction of growth of individual blades of grass affects the rolling of a golf ball and is called the grain. When individual players have all brought a ball into play, the player whose ball is the farthest from the hole is next to play. In some teams events, a player who is farthest from the hole may ask his or her partner who may be closer to the hole to play first. When all players of a group have completed the hole, the player or team with the best score on that hole has the honor, that is, the right to play first on the next tee. Many holes include hazards, namely bunkers (or sand traps), from which the ball is more difficult to play than from grass, and water hazards (lakes, ponds, rivers, etc). Special rules apply to playing balls that come to rest in a hazard which make it highly undesirable to play a ball into one. For example, a player must not touch the ground in a hazard with a club prior to playing a ball, not even for a practice swing. A ball in a water hazard may be played as it lies or may be replaced by dropping another ball outside the water, but a penalty is incurred in the latter case. Every hole is classified by its par, the theoretical number of strokes that an expert golfer should require for playing the ball into any given hole. The expert golfer is expected to reach the green in two strokes under par (in regulation) and then use two putts to get the ball into the hole. Many 18-hole courses have approximately four par-three, ten par-four, and four par-five holes. The total par of an 18-hole course is usually around 72. Each player acts as marker for one other player in the group, that is, he or she records the score on a score card. In stroke play (see below), the score consists of the number of strokes played plus any penalty strokes incurred. Penalty strokes are not actually strokes but penal points that are added to the score for violations of rules or for making use of relief procedures in certain situations. To allow players of different proficiency to play against each other on equal terms handicap systems are used. A handicap is a numerical measure of an amateur golfer’s ability. It can be used to calculate a so-called “net” score from the number of strokes actually played, thus allowing players of different proficiency to play against each other on equal terms. 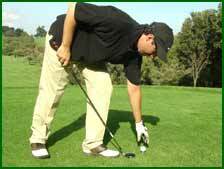 Handicaps are administrated by golf clubs or national golf associations. Handicap systems are not used in professional golf. Most touring professionals play several strokes per round better than scratch. The two basic forms of playing golf are match play and stroke play (see our separate article about the Types of competition).